Picea pungens galuca Family: Pinaceae (Pine family). Habit: Distinctive evergreen tree. Height 40 - 80 feet, occasionally over 100 feet, spread 30 - 40 feet. Tree has a layered look and it is the slowest growing of the trees in the spruce family. Bark is purplish gray to brown flakey and reddish brown and furrowed with age. Foliage is stiff, short, sharp, pointed, bluish green leaves spreading out all around the twig somewhat upswept and curved. Twigs are very short stout, shiny and yellowish brown. Seed cones are cylindrical long scaly shiny chestnut brown tapered slightly to a jagged tip. Culture: It mainly grows in the Rocky Mountain region of the United States but can be successful in many parts of the country except for the hot and humid areas where the tree would struggle in the summer. 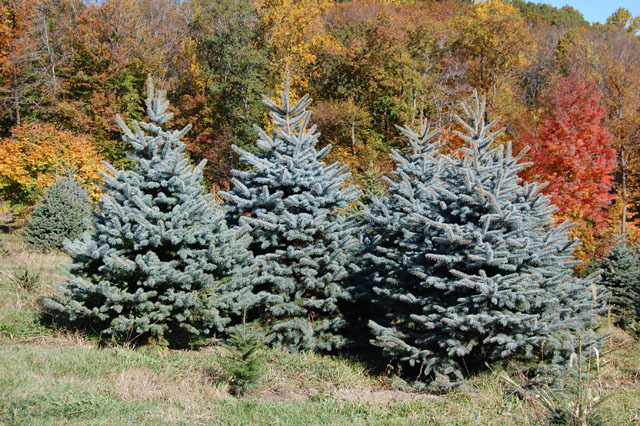 Blue spruce likes cooler climates and can even survive ice storms well due to its strong branching also make it ideal as a Christmas tree. Pruning should not be done during damp weather. Possible. Propagation by seeds or stem cuttings. Zones 3 - 8. Problems: Aphids can sometimes be a problem - also bagworms, spider mites and needle miners. Control bagworms with the release of trichogramma wasps. Use Garrett Juice with BioWash or BioSafe for the other pests. Needle cast disease can be a problem but is controlled with the Sick Tree Treatment. It can also be helped by increased air circulation around the trees. White pine weevils can sometimes kill the terminal growth on a blue spruce that is in stress. They can be controlled with beneficial nematodes. Notes: Over 50 cultivars are available. Deer can sometimes be a problem, especially on young plants but Deer Scram is one solution. On planting use my basic recommendations that are under Organic Guides on the Home page of the website.